When in Sydney in early April, I was lucky enough to attend a bookish event organised by Allen & Unwin in the CBD. I had to go to a memorial in Martin Place, look for a woman in a Kimono and tell her I was there to read The Crane Wife. I was then given a copy of the book. The lucky recipients then adjourned for a flash mob reading of the book which was pretty exciting, despite the rain. I was lucky enough to pick up an additional copy after the event which will be part of a giveaway, details to follow at the end of this review. George, a divorced and lonely man is woken one night by a keening sound, only to discover a great white crane in his backyard. The bird is powerful and has a real presence but is painfully injured with an arrow through its wing. George helps the bird and his life is changed from that moment on. I hadn't heard of the Japanese folk tale that formed the inspiration for this story, and I think it was better that I hadn't. 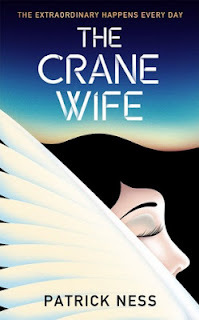 It took me a while to settle into the pace of The Crane Wife - it's quite different to what I usually read - but the writing was beautiful and the themes were all about love and forgiveness. I enjoyed George's flawed character, the mythology aspects throughout the novel and the ending was very touching. "... let's-carpe-the-unexpectedly-sunny-diem-and-have-an-impromptu-picnic/endurance-session in the park..."
For your chance to WIN a brand new copy of The Crane Wife by Patrick Ness courtesy of Allen & Unwin, leave a comment below and tell me if you had a choice to be a bird for a day what species of bird would you be? Tweet about the competition on Twitter, using my handle @Carpe_Librum1 and a link to this post. Tell me what you shared or followed in your comment to receive an additional competition entry for each method. Entries close midnight, Sunday 19 May, 2013 and the winner has 3 weeks to claim their prize. (Open to Aus & NZ residents). Good luck everybody, Carpe Librum! A pelican because they look ungainly on land but are graceful in the water and air. Oh, I love your response Brenda, I think I'd love to be an owl, beautiful and wise, sleep during the day and cruise the air at night! And Marg, what an unexpected answer, but I have been told I have a big mouth, so perhaps I would make a better pelican, lol! I admire the tenacious little northern chickadee so would pick that. Oh, I would LOVE to do a 'Kimono search' kind of book finding! Hmm, birds to be. If the range includes mystical birds, I'd be a Roc because they're huge, scary and I could enjoy scaring the code brown out of some people. Or a phoenix, because being reborn from actual fire as opposed to life-generated flames would be a novel experience. If not mythical, I'd be an albatross - they dive, float or fly for years at a time, never touching the ground. I adore owls so would have to say an owl. I already follow your blog and like someone else mentioned have no idea about twitter. Oh wow Selwyn, I'd never heard of a Roc before, but they're incredible!!! Are they featured in any books that you can remember? And love your other suggestions, I'd love to be Dumbledore's Phoenix! Thanks for your (multiple) entry too Dale, owls have such grace don't they and are so collectible too. I would love to be a Golden Eagle, after watching The Rescuers Down Under it made them look so magnificent. I would pick penguin. They can't fly but they are the cutest bird there is. In some ways, they live similar to us, they live in colony. Thanks Amy, a Golden Eagle is a glorious suggestion, I'm surprised it's taken so long for someone to suggest it. And thanks for your entry too Lid, I'm really surprised by the diversity of preferences here. Keep them coming! Hi Trace. I would be an Emu because (like me) they don't conform and they are proud to be weird: they can't fly and can't walk backwards; but boy they give the other animals a run for their money. Or I would be a lyrebird, who are crafty and spend their day mimicking other birds and then steal their nests! That really made me laugh, thanks for both of your suggestions Susan, brilliant! The competition has now closed, so thank you all for your entries.